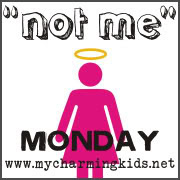 Today I'm making a little time to join in on MckMama's Not Me Monday. 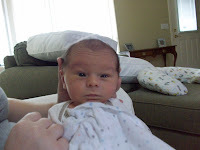 It seems that I have time to blog at 2:30 am... as this is when my little man decides he wants to be awake! This past week has been an exhausting one for me... that being said, I have made some "Postpartum Follies", as Jason likes to call them. If you'll remember from some previous posts, I had my share of Pregnancy Follies while pregnant with Aidan. These would include leaving my purse at a restaurant which resulted in us missing a flight home to surprise our families for the weekend, breaking multiple glasses while washing them and leaving the pantry light on constantly, to name a few. So, that being said, it was NOT me who attempted to do a load of laundry after coming home from the hospital, putting the soap and detergent in the machine and then never starting it. It was NOT Jason who found my sad attempt at housework the next day still in the washing machine. It was also NOT me who misplaced Jason's house keys after coming home from CVS. It was NOT us who searched the house high and low, with no keys to be found. The keys were NOT found by Jason on Sunday at the bottom of our trash can. Nope, I would NOT have done something so stupid as to throw away his house keys! And finally, it is NOT my little man who loves to be up in the middle of the night, just like he was in the womb. My sleep schedule is NOT completely out of wack now, with me being unable to sleep at night. Well, I am going to try and settle this little guy down so we can get some shut eye. Hi! I found you over at Mama M's when I saw you were from Texas (DFW area here) and had to congratulate you on your adorable little guy. Gotta love those night owls! Aidan is adorable! Screw the housework...just get some sleep when your little man sleeps and enjoy your time with him. Hey atleast yo tried! That is more then I have done lately and my youngest is 2! Love your bog and am going to follow NOW! 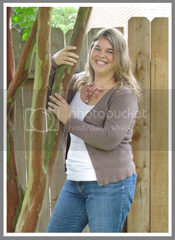 Found you on MckMama's and had to click b/c I am in Texas too! Tyler if you are familiar with E. TX :) Congrats on the new little one. I promise you'll be make to normal soon! hi! visiting from mckmama...your blog is great. love your post. congrats on your precious little boy. love the picture of him. I'm so happy for you guys! Aidan is Two Weeks Old! Aidan Is One Week Old!